March 6th-8th, 2015 in Quartzsite, Arizona! The Grand Gathering is an exciting 3-day event being planned for March 6th – 8th, 2015. 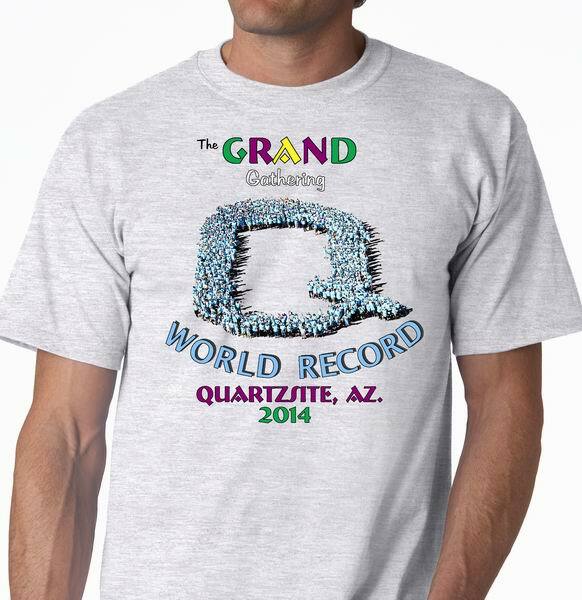 The Quartzsite Improvement Association (QIA) and local organizations are planning the World’s Largest Gathering of Grand Parents and Great Grands! In true community spirit, cooperation is occurring between the Town of Quartzsite administration and many local organizations to produce an exceptional event for the community and visitors alike. Last year was such a success we’re planning more fun for March 2015! 9:00-4:00 Health Fair with La Paz Regional Hospital and La Paz County Health Dept. for Largest Human Letter “Q”! We are delighted to confirm that you have successfully achieved a new GUINNESS WORLD RECORDS title for ‘Largest human letter’. We would like to congratulate you on your record-breaking achievement. World Record T-Shirt $15 + shipping. Had lots of fun being part of this event and will remember it for ever. will you be putting this event on the internet? Discussions are being held for future events. To whom it may concern, a group of six of us attended the “Grand Gathering” on Sunday morning March 9th. We arrived at about 10:30 am only to learn that the world record attempt was filled up AND they were out of t-shirts. Asking a few questions informed us that the “quota” had been met almost a week earlier. First, your advertisements said you were looking for MINIMUM of 550 people, not MAXIMUM. Second, it also stated in place of the official shirt a sky blue shirt could be worn. Third, why was it not posted on your website that all was filled up? It would have saved us from over an hour drive just to be turned away. I would hope there is much better preparation and information in the future. We apologize for the inconvenience. Our Guinness Attempt Coordinator, and the inspiration behind whole The GRAND Gathering event, had to leave Wednesday to attend his sister’s unexpected crossing out of state, and missed the whole event. He hopes to be back for the next board meeting and has more ideas to share for the future. Volunteers jumped in everywhere doing multiple tasks, to fill the void. It’s really amazing how many volunteers appeared at the last minute to help. The decision to close registration was made Thursday night, however discussions continued on regarding if, and how, to squeeze everyone in. There were official shirts still available for sale on Sunday, however the only sizes left were 3X & up. Plain sky blue shirts were also available for purchase or for rent for the day. The board was very surprised, though grateful, for the unexpected turnout. The venue and letter Q was designed far in advance for 550 people by our Guinness Coordinator. At the last minute the volunteers scrambled to accommodate the extra people already registered. The witnesses and “clickers” counted 631 people with wristbands, however only 625 were recorded by the stewards. The organizers will submit their documentation to Guinness for verification, which can take up to 6 weeks. The board members meet next week to discuss options for the future. Now that there has been one successful attempt, we hope for more in the future.